JewishWorldReview.com | Tea party insurgent Chris McDaniel came tantalizingly close to knocking off Senator Thad Cochran in Mississippi's Republican primary runoff last week, but a surge in black voter turnout saved the six-term incumbent's bacon. Cochran's election to a seventh term in November now seems a foregone conclusion, and boy, are a lot of conservatives mad. Receive Jacoby and many, many more. Sign up for the daily update. It's free. Just click here. Well, don't tell that to McDaniel, who was confident that his bid to knock Cochran off the November ballot had gone from "the improbable to the unstoppable." Instead it was McDaniel who got knocked off. 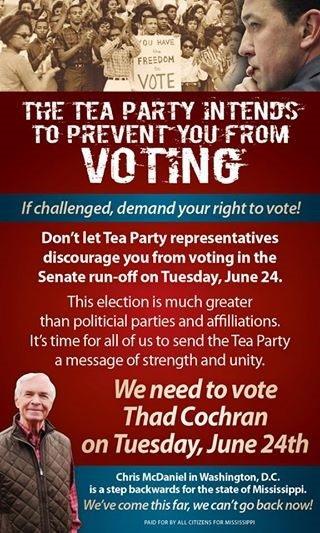 Cochran's appeal to black voters may not have been honorable. It certainly wasn't conservative. But it was indubitably effective: In the 24 Mississippi counties with black majorities, turnout soared by an average of 40 percent from the primary to the runoff. One of the most senior members of the state's Republican establishment just won the fight of his career. What turned the tide was the exercise by black citizens of their right to vote � a right that is no longer endangered anywhere in America, not even in Mississippi.